December 31, new year eve, is the last day of the year for everyone. In Japan, new year day (Oshogatsu) is very important day and people have big party to celebrate new year with family or friends during Jan. 1st to 3rd. So people are very busy for preparation and clean up home (Oosouji). Normally many companies are off from Dec. 30th to Jan. 3rd. If you have lived in Japan, you might see many special foods for Oshogatsu which are called “Osechi Ryori” at stores after Christmas. Also you will find Soba Noodles as a meal for Dec. 31st. It’s one of Japanese food culture, and called as “Toshikoshi Soba.” Toshikoshi Soba is a custom inherited since more than about 200 years ago. This custom seems to be since Edo Era (1603 – 1868). It’s natural because Soba Noodles was developed around 16th to 17th century as I mentioned before. Why are people eating Soba at the day? There are several stories about the reason. I would like to introduce well known two stories. Soba Noodles is usually narrow and long. People pray for long life like Soba Noodles. Old gold workers were using dumplings of Soba to correct gold dust. People thought Soba was a food for luck. In any case, people pray better things for the next year such as long life, luck etc. I think those pray is common sense of all people in the world. Actually, I usually eat Toshikoshi Soba at Dec. 31st. every year however I am not conscious about that meanings. But I also want to pray such so regarding my friends, family and myself. 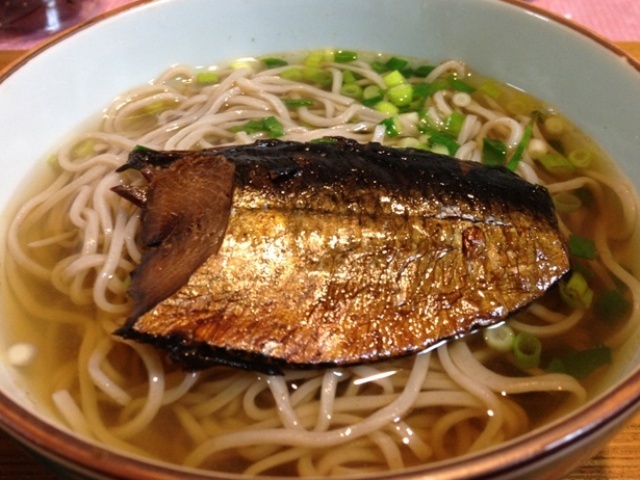 Above photo is “Nishin Soba” which topping is simmered herring with hot soup. The most popular topping is Tempura Shrimp. Some people are eating cold soba. What toppings or which hot or cold soup you eat is not big matter. The important thing for this custom is to eat Soba Noodles. In 2013, Japanese food (Washoku) is authorized as Intangible Cultural Heritage by UNESCO. I heard one reason is that Japanese traditional food has close relation with seasonal event. Toshikoshi Soba also same.